It was only a matter of time until iOS devices got their very own roller coaster management game. 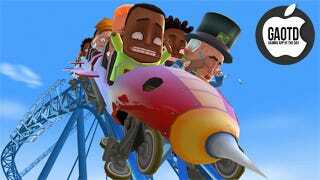 There may not yet be an iOS version of Roller Coaster Tycoon, but now we've got the next best thing: Coaster Crazy, a new free iOS game from Frontier Developments, the studio behind RollerCoaster Tycoon 3. Coaster Crazy takes a global approach to amusement park management: You'll begin by flicking the globe about with your fingers, and choosing the location of your first roller coaster from among several major cities. (I began in Australia, because why not?) From there, you'll zoom down on the nation in question and pick from among several different topographical maps before beginning on your coaster. In Coaster Crazy, the goal is to design roller coasters that are fast, lengthy, and thrilling enough to keep your testers happy. That's easier said than done—you'll spend a lot of time bending, warping, and expanding your coasters to get things moving faster and more excitingly. Every time you do a test run, you'll get to watch the thing in action, then will be scored on how good your roller coaster is. Coaster Crazy is fun and addictive, and the game really thrives in the details. The little tester characters are all funny and each have their own wee personality, which they show of at the beginnings and ends of runs. There's a built-in camera function that allows you to take and store great freeze-frame shots of your coasters in action. The music is quite groovy, and combines with the broad, stylized color palette to evoke Psychonauts, of all things. Once you get a roller coaster passed its initial certification, it begins to earn money for you, and you can expand to other building sites and build more coasters. The real fun is in the roller coaster-design, but it's also enjoyable to build your global empire. As Coaster Crazy is free-to-play, you'll have to wait for your new developments to take root in real time, though you can of course pay to eliminate the waiting. But it's not that big of a nuisance, as free-to-play games go. And even if you never pay a cent, there's a huge amount to enjoy. And hey, if you get bored, you can always go back and sabotage one of your existing tracks to re-create Final Destination 3.